The study chair breaks new grounds in its old home town: Uppsala. Carl von Linné's practical and brilliant study chair is back - developed and adapted to meet the demands of today. This exclusive and modern study chair is now looking for a home in crowded cities. It is perfect in student rooms, apartments, universities, schools, offices or other cultural working places as long as it gets a chance to serve its purpose wherever there is a need. 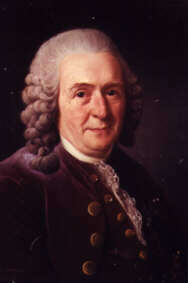 The most famous scientist of all times from the University of Uppsala. Carl von Linné probably had his study chair made in the mid 1700s, being inspired by among others, foreign monasteries and university libraries, where heavy and cumbersome books were often used. And so he built this exceptional desk-chair which he used both as study chair and pulpit for his lessons and lectures. We have now redeveloped the production technique for an improved ergonomic and aesthetic version. Every sold chair will support the Linnéminnena (Linné's Memory). Linné's old study chair is on display at Linnés Hammarby, south of Uppsala. You can also see and try the new study chair at the University library : Carolina Rediviva.